A train carrying 41 containers departed from Tangshan in Hebei Province on April 26 with destination Antwerp, traveling 11.000 kilometers through Kazakhstan, Russia, Belarus, Poland and Germany. The train service will cut transport time from the usual 45 days by sea, to just 16 days. Tangshan has two port districts: Jingtang and Caofeidian. They handled 573 million tons of freight last year. The freight service offers a new way not only for the freight of Beijing, Tianjin, and Hebei to Europe, but also for that of Japan and the Republic of Korea to Europe via China, said Xu Fengyi, Director of Tangshan Customs. Tangshan, about 150 km from Beijing, is known for its coal resources and steel industry. In 1881, a 9.7-km railway line from Tangshan to Xugezhuang opened for coal transport. Designed by English engineer Claude Kinder, it was the first line with a global standard track gauge of 1,435 mm in China, the Shanghai Daily reports. The line was later extended to Mukden, now called Shenyang in Liaoning province, transporting both cargo and passengers. During the extension project, Zhan Tianyou, a Yale graduate and designer of a railway bridge along the line, Luanhe Bridge, drew the attention of the government. Zhan was later appointed Chief Designer of the Beijing-Zhangjiakou line, the first railway designed and built by China in the early 20th century, which is still in use. “Although the design and construction were done by Chinese people, all parts, including every single nail, were imported from abroad,” said Gu Lin, Manager at Tangshan South Station, the starting point of the Tangshan-Xugezhuang line. By March, freight trains were operating between 43 Chinese cities and 41 cities in 13 European countries. The first special trains for e-commerce freight delivery services between Shanghai and Beijing started running in July, marking the initial step of opening up rail services to commercial clients, China Railway Corp (CRC) said. CRC has reached an agreement with courier service providers and postal services authorities that the fast trains for e-commerce freight delivery may extend to the Yangtze River Delta, Pearl River Delta and Bohai Rim. SF Express, one of China’s largest courier services, contracted the first fast freight delivery train between Beijing and Shanghai. Other e-commerce platforms and courier services also are in negotiations with CRC to contract trains for parcel delivery. Rail delivery is faster than road transportation and much cheaper than cargo shipping. “Current air freight from Shanghai to Beijing may cost more than CNY0.8 per kilometer, while train freight is under CNY0.4 per kilometer. 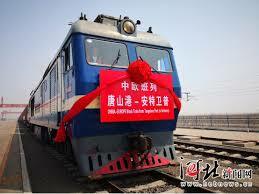 Intercity freight by train may be both cost-saving and time-saving,” said Huang Zhijun, a freight agent in Shanghai. “But for long-term cooperation and smooth operations, railway services must improve current warehousing, adjust to their schedules and link up railway and couriers’ outlets”, said Shi Jianjun, Manager with Shanghai Yuntong Shipping Consultancy Service. According to a report by CRC, in the first half of 2014, combined parcel delivery volume by rail in China totaled 770,000 metric tons, a 23.4% year-on-year drop. More fast trains for e-commerce and courier clients running between Beijing, Shanghai and Guangzhou were launched at the end of August. China is negotiating with the governments of Mongolia, Uzbekistan, Kyrgyzstan and Pakistan to build three connective railroads to improve regional trade in the Silk Road economic belt. Huang Shengqiang, Director of the China Port Management Office, said China has already opened 25 international airports and land ports as well as 12 special trade areas along the economic belt within the country. It will continue to build regional freight stations and create more trading platforms with Kyrgyzstan, Pakistan, Mongolia and Nepal, Huang said. Since 2010, major Chinese cities, including Chengdu, Chongqing, Xian, Zhengzhou, Wuhan and Yiwu have began weekly or monthly train services to European and Central Asian destinations, part of China’s efforts to turn its inland resources and labor-rich cities into international trade hubs. Eighty-six cargo trains carrying 7,450 containers passed through the Alataw Pass railway station on the China-Kazakhstan border between January and July of this year, with trade volume reaching USD1 billion, according to customs. Transport Minister Yang Chuantang said regional connectivity is in the interests of all countries on the Silk Road Economic Belt. Yang added that China is following the Asian Highway Network deal signed in 2004 and the Trans-Asian Railway agreement of 2006 to continue its railway investment and develop major entry-exit rail and road projects. China has allocated funds to do preliminary research on building an international railway connecting the westernmost city of Kashgar in Xinjiang with Pakistan’s deep-sea Gwadar Port on the Arabian Sea, according to the Director of Xinjiang’s regional Development and Reform Commission. “The 1,800-kilometer China-Pakistan railway is planned to also pass through Pakistan’s capital of Islamabad and Karachi,” Zhang Chunlin said at the two-day International Seminar on the Silk Road Economic Belt. The railway, running through the Pamir Plateau and Karakoram Mountains, will be one of the hardest to build. Control of Gwadar Port was given to China and an agreement was signed with China Overseas Ports Holding Co on May 16, 2013, to transfer operational rights from the Port Authority of Singapore. Work is also due to begin soon on the long-planned China-Kyrgyzstan-Uzbekistan railway. The region, which borders eight countries, also plans to open three new land ports to Kyrgyzstan, Kazakhstan and Russia. “We will consider opening the ports to Afghanistan and India once social stability can be ensured. After all, openness is the foundation of boosting trade,” Zhang said. The 11,800-kilometer Suzhou-Manzhouli-Europe railway line, which opened last September, is expected to boost China’s trade with Eurasia. The train line starts in Suzhou in Jiangsu province, runs to the Chinese border city of Manzhouli and finishes in Warsaw, Poland. The whole trip takes 18 days. Compared to other train lines the new railway cuts traveling time by four days and reduces costs by USD2,100 per container. New lines connecting Manzhouli with Zhengzhou, the capital of Henan province, as well as Guangzhou, the capital of Guangdong province, are expected to start running soon. In the near future, Manzhouli is expected to become a hub for international logistics. In April, the line from Suzhou hosted four trains carrying LCD monitors and laptops. The combined value of the trains was USD9.4 million. From March to June a further 12 trains were due to run. Returning trains mostly carry vehicle parts from German automaker BMW bound for Shenyang and Beijing. The line is expected to benefit China’s trade with Poland, Hungary, Austria, Germany, Czechoslovakia, Romania, Ukraine and Russia. Rail freight capacity from the Manzhouli hub could reach 70 million tons a year. Last year, capacity hit 30 million tons. Manzhouli is the country’s appointed auto parts and vehicle import port, due to its capacity.